← The Abbey Vaults leaves a farewell gift. 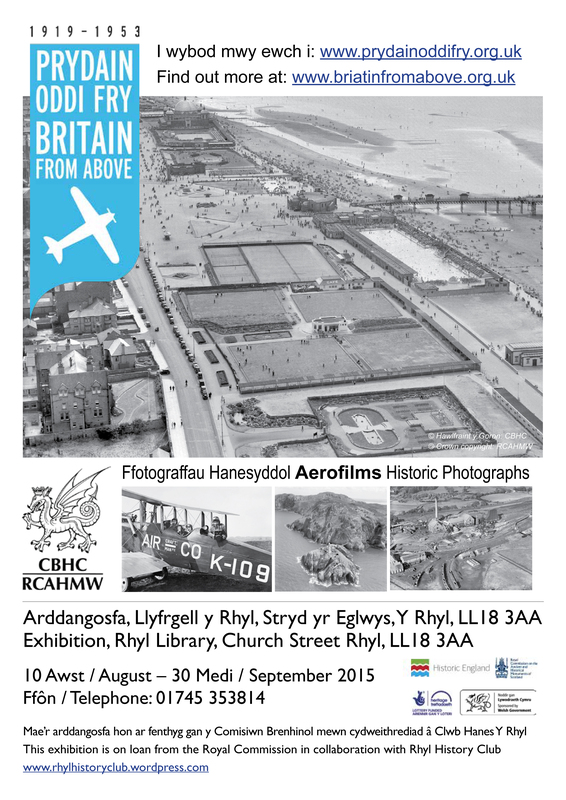 Britain from Above: Wales is the Royal Commission’s travelling exhibition of the oldest and most intriguing of the Aerofilms historical photographs. The Aerofilms Collection is a unique archive of one million aerial photographs dating from 1919 to 2006. The collection was acquired for the nation in 2007 by English Heritage and the Royal Commissions on the Ancient and Historical Monuments of Scotland and Wales, supported by the Heritage Lottery Fund. With photographs drawn from across Wales, this exhibition of unfamiliar images of familiar places will encourage audiences to explore the meaning and impact of change, place and memory. Unique occasions captured in North Wales include: the ceremony at the recently-erected Cenotaph war memorial during the visit of the Prince of Wales in November 1923; a view of Rhyl’s seafront in its heyday in 1949; the Royal Welsh Agricultural Show held in Abergele on 26 July 1950; and the eerie stillness of Gresford Colliery, one month after the mining disaster of 22 September 1934, when a major explosion and subsequent fire killed 266 miners. Other images include the picturesque magnificence of Snowdonia and the simple, barren cragginess of South Stack, Holyhead, as well as the iconic Edwardian castles. This exhibition will be on display at Rhyl Library, Museum and Arts Centre, Church Street, Rhyl, Denbighshire, LL18 3AA, Wales from 10 August–30 September, and is on loan from the Royal Commission on the Ancient and Historical Monuments of Wales in collaboration with Rhyl History Club.